"As proposed, the project would do next to nothing to improve access to the airport," writes Yonah Freemark of The Transport Politic. 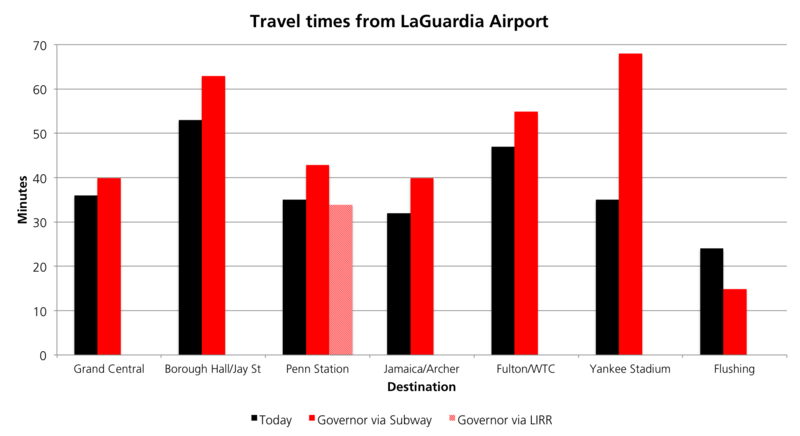 "In fact, compared to existing transit services, most riders using the AirTrain would spend more time traveling to LaGuardia than they do now." Freemark's time findings are charted here, showing current transit access to the airport, and access via both subway and Long Island Rail Road (LIRR) to the proposed AirTrain terminal at "the 7 Subway station at Mets-Willets Point and about 600 feet north of the LIRR station" in Queens. This finding suggests that for most people in the Bronx, Manhattan, Queens, Brooklyn, and Long Island, AirTrain services will not be beneficial from a time perspective. Freemark spots an likely illustration error that anyone who has ever taken an AirTrain would notice. The second slide in the "Building a New New York" [PDF] accompaniment to the governor's "2015 Opportunity Agenda: Restoring Economic Opportunity" (that describes not only the LaGuardia AirTrain but other proposals in the governor’s infrastructure plan) depicts an image of the AirTrains. The bizarre rendering included in the governor’s presentation suggests that the project would feature an elevated guideway and train cars that appear to have been lifted from the LIRR. One can only assume that this image was photoshopped by someone who is not familiar with transportation technology. Nevertheless, the plan clearly has its virtues. Like the AirTrain connection for JFK Airport at Jamaica, the Willets Point AirTrain terminal allows for both commuter train and subway access, although LIRR service would clearly not be as frequent as that at Jamaica Station, the hub for the LIRR and second busiest after Penn Station as all but one of its eight branches (per Wikipedia) serve it. The one that doesn't stop there, the Port Washington branch, currently only stops at Mets-Willets Point "during Mets Home Games and special events." Other criticisms of the proposal were included in The New York Times article (posted here). "Andrew Albert, a rider representative on the [Metropolitan Transportation Authority] board, said he was concerned about an influx of airport-bound riders on the crowded 7 line," reports Michael M. Brynbaum. However, as with most big-ticket transportation projects, finding the money may be the critical factor. When asked, Cuomo "said the costs would be absorbed within 'existing' state resources." However, the compelling reason for the AirTrain proposal may would be self-evident for anyone who has ever flown into or out of LaGuardia. A survey by the Port Authority in 2008 showed that 75 percent of travelers from Manhattan used a taxi or car service to reach the airport; only 16 percent rode buses or shared a van.